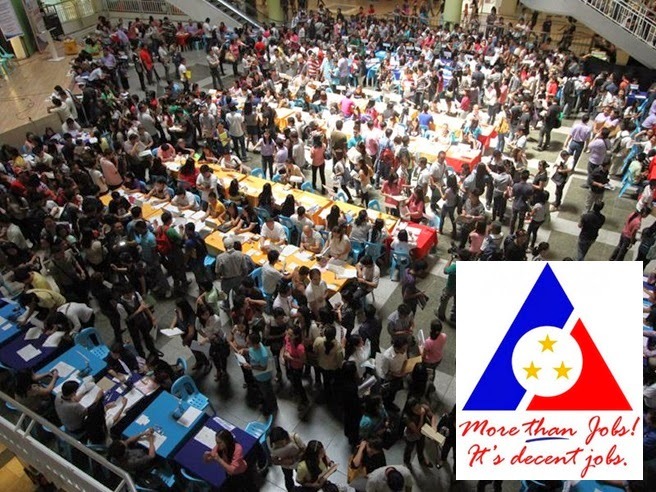 Manila, Philippines - Department of Labor and Employment (DOLE) Secretary Rosalinda Dimapils-Baldoz annoucned recently the job fairs in Metro Manila, with 17 venues already confirmed, will be the biggest job fairs on May 1, 2014 Labor Day, in terms of number of job vacancies. "With 65 job fairs already firmed up, the job fairs in Metro Manila will easily be the biggest in terms of job vacancies, with over 77,000 job vacancies already tallied and still counting," Baldoz said in a press release. "In fact, many more employers are requesting the DOLE National Capital Region for slots, but unfortunately, the biggest venue, the SMX in Pasay City, can only accommodate so much," she added. Of the 77,000 job vacancies, Baldoz said 9,994 are for police officers to be hired by the Philippine National Police, and 9,000 for various vacancies in the Bureau of Internal Revenue, including lawyers and accountants. The other day, she already announced the regional venues of the 65 job fairs to be held simultaneoulsy nationwide on 1 May. "The 65 job fairs will be simultaneous nationwide. These will be held in different venues in 16 regions under the overall supervision of the DOLE," said Baldoz, saying the 2014 Labor Day theme, “Sa Sipag, Tiyaga, at Talino, Buong Mundo Saludo sa Manggagawang Pilipino” will be reflected in all Labor Day activities as a way of recognizing the invaluable contribution of all Filipino workers to the continued growth and resurgence of the Philippine economy. In Metro Manila, the 17 job fairs will be held in the following venues: (1) SMX Pasay City (170 employers, 58,004 job vacancies); (2) SM North Edsa (65 employers, 6,499 vacancies); (3) SM Megamall (55 employers, 1,715 job vacancies); (4) SM Valenzuela (27 employers, 400 job vacancies); (5) SM Fairview (13 employers, 2,462 vacancies); (6) SM Novaliches (12 employers, 295 job vacancies); (7) SM Manila (41 employers, 411 job vacancies); (8) SM San Lazaro (16 employers, 825 job vacancies); (9) SM Sta. Mesa (37 employers, 190 job vacancies); (10) SM Pasig (2 employers, 96 job vacancies); (11) SM Marikina (20 employers, 2,341 job vacancies); (12) SM South Mall (12 employers, 595 job vacancies);(13) SM Las Pinas (4 employers, 41 job vacancies); (14) SM Sucat (7 employers, N.A. ); (15) SM Bicutan (20 employers, N.A. ); (16) SM BF-Paranaque (4 employers, 101 job vacancies); and (17) SM Muntinlupa (65 employers, 622 job vacancies). Some of the employers in these job fairs are 8 Dynamics Golden Rays, Abensons, Able Bodies, Absolute Sales Corp, Aimstaff, Aktus Global, Amphil Food Concept, Inc., Arkipel Software Development, Arm Resources, Inc, Asiapro Cooperative, Arc Refreshements Corporation, Automatic Appliance, Bank of the Phil. Islands (BPI), Bayanihan Placement, Benby Enterprises, Best Allied Services, Bioessence (Skin Slimming & Spa), Ble Best Manpower, Brew Master, BSB Group Of Companies; BSB Junrose Auto Parts, Inc., Canadian Tourism, Cebuana Lhuillier, Consult Asia, Concentrix, Dames International, Datascope, Dermcare, E Performax Contact Center, Emerald Garments Manufacturing (RRJ), Empire East Land Holdings, Eurotiles, Executive Genesis, Fasteners, Field Oursource Asia, Gaic Manpower, Gakken, Golden Donuts (Dunkin Donuts), Health Station, Human Integrated Resources, Interlink Manpower, K Servicio, LBP Service, LED Management; LTC Multi-Services, Manos San Rafael, Marks and Spencer (Rustans), Mega Cellular, Mirof Resources, Nissan Sales, North Point Devt., Bank Pharma Best, Inc. (Good Fellow Pharma), Phil. Pinoy Job, Philcopy, Philman Power Center, Pipols Synergy Management, Pj Lhuillier, Pr Gaz,Primus Knowledge, Quinn Data Facilities, Rajah Travel Corp., RB Paringit, Inc., Rice In A Box, San Miguel Corp., Service Resources, Servicio Filipino, Sitel Philippines, Skills Talent Employment Pool (Step);Sky Cable, SM Group of Companies, Sobida Motors Corp., South Gate Sports Central, St. Lukes Medical Foundation, Teleperformance, Teletech, Temps And Staffers The Medical City Toyota-Makati Transorient Manpower, Triple E Manpower, TSD Global, Vicma Marketing, Wizard Manpower, and Yakult Philippines. DOLE NCR Regional Director Alex Avila said that pre-employment documentation services will be available at the job fair at the SMX to be provided by the National Bureau of Investigation, Professional Regulation Commission, Social Security System, Pag-IBIG, Philippine Statistical Authority, and Phil-Health. "The TESDA will also offer free massage and haircutting services, including a skills demonstration for baristas. Smart Communication, a major sponsor of the 2014 Labor Day event, will also offer free calls for OFWs and their families, as well as free printing and photo services," Avila added. Any question about this release? Please call the Bureau of Local Employment at tel. nos. 527-2539 or 527-2453; or the DOLE Regional Office in your area: DOLE-NCR, tel. no. 400-6242 or 400-6011.